ATLANTA—Taking advantage of the new service that saves time and undue stress, sources confirmed Monday that more travelers are avoiding long airport lines this season with Cinnabon PreCheck memberships. 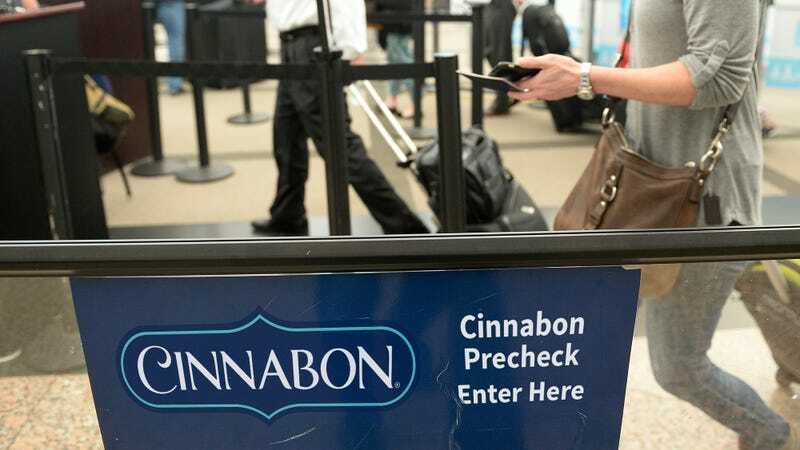 “With Cinnabon PreCheck, you can skip the arduous waits at the airport and speed through to grab a warm, gooey cinnamon bun before hopping on your flight,” said Cinnabon spokesperson Raina Butler, adding that thousands of passengers miss flights every year after being forced to wait in slow-moving lines for their sweet baked cinnamon rolls. “To take advantage of Cinnabon PreCheck, all you have to do is pay a $50 fee and pass a simple online background check, which takes less than five minutes to complete. Then, instead of waiting, you can just walk straight to the PreCheck express lane, procure your Caramel Pecan BonBites or bag of Cinnasweeties, and be on your way without any of the hassle normally associated with busy airport Cinnabons.” At press time, Cinnabon PreCheck users were issuing complaints after the waits at the express lanes had become nearly as long as the normal Cinnabon line.